Words Can’t Begin to Describe…. I make no claims to being an artist. Nor will I argue whether a photograph can be art – or not. However, my images with which I am most pleased are the ones that create a certain “Je ne sais quoi” emotion within me when seen in the viewfinder – which seems to fit Amy Lowell’s criteria. Words can’t begin to describe the beauty of nature as depicted in this abstract of shapes, colors and tones. Words Fail – beau·ty (by t ) n. 1. The quality that gives pleasure to the mind or senses and is associated with such properties as harmony of form or color, excellence of artistry, truthfulness, and originality. Although this image satisfies most or all of the parts of this dictionary definition, the definition falls well short of expressing what I felt. 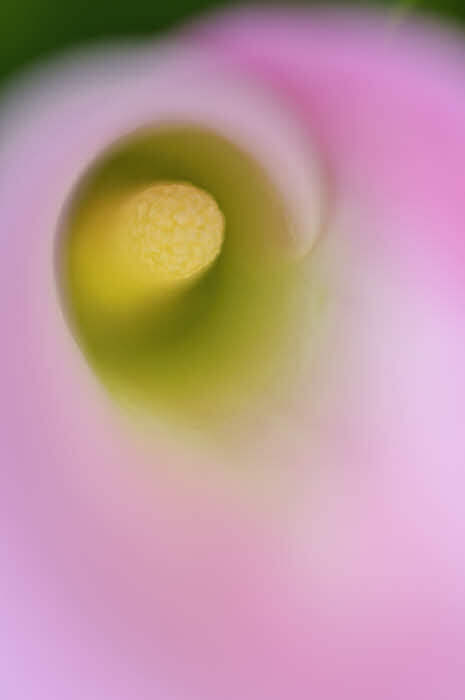 Image was made yesterday when my camera took me down a path less traveled, ten feet outside my front door, where I spent a delightful hour making images of my first calla lily of the season. Dahlias are close behind – many more paths to travel & worlds of beauty to explore. Grab your camera and take your own journey. This entry was posted in Composition and tagged Art, Art Photography, Photography, Photography Composition, Photography How To, Photography Technique, Photography Tips, Visual Design by Ed Knepley. Bookmark the permalink. I think what is and is not art is up for debate. So I will just say this. I this the picture! How interesting it is that we spend a life trying to master the best possible focus on a subject and when it comes to some are we do just the opposite. This makes for a very interesting outcome, neat! It would be a dull world if every image had identical exposure and focus. Varying things up is what makes it fun.